The western media is enthralled by Palestinian teenager Ahed Tamimi but they have no time for the tragedies encountered by her fellow Palestinians from the West Bank to Gaza. 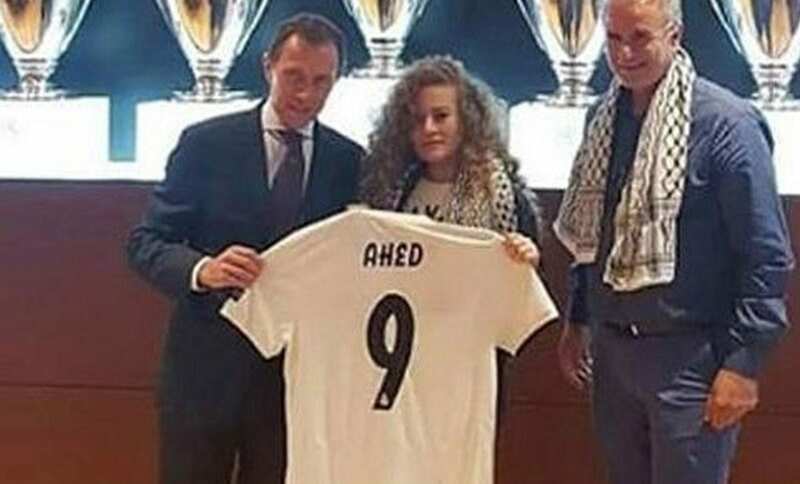 I am delighted that legendary Spanish football club Real Madrid rolled out the red carpet for heroic Palestinian teenager Ahed Tamimi following her release from prison after serving eight months for slapping a couple of Israeli soldiers twice her size. The diminutive 17-yearold captured the imagination of many around the world. It was a certainly a moment of good news when she and her father Basim were hosted at the famous Santiago Bernabéu Stadium in Spain’s capital Finally, free, the 17 year old Palestinian released from Israeli Jail and the media coverage reinforced this. However the bad news is that seven other young Palestinians in Gaza paid the ultimate sacrifice in their peaceful resistance to Israel’s brutal military occupation and few column inches followed. Both stories are, of course, newsworthy but only one was covered by the fickle western media which seems to use a racist barometer when it comes to editorial content. Sadly, in stark contrast, the funerals of Iyad Al-Shaer, 18, Muhammad Haniyeh, 23, Muhammad Shakhsa, 25, Muhammad Anshahi, 18, Muhammad Al-Awawdeh, 26, and two children — Muhammad Al-Hum, 14, and Nasser Musbeh, 12 — prompted no media interest other than a couple of paragraphs which did not even bother to mention their names. Imagine if seven young people including two children were cut down at a peaceful demonstration anywhere else in the world. But this is occupied Palestine and their killers were Israelis. No matter that the seven died or that around 500 others were injured with more than 200 requiring hospital treatment. Had this happened in Europe or America there would have been headline news and we’d still be analysing and disseminating the information in our newspapers today. Kill white folks in the US or Europe, and you will rock the headlines, but the truth is non-white lives don’t seem to matter. This complementary racism is relied upon by the regime in Tel Aviv which is rarely challenged over its regular human rights abuses and brutal treatment of Palestinians while occupying their land. Tragically this will continue as long media scrutiny focuses elsewhere. Despite the horrific toll on Friday, Gaza’s Great March of Return protests look set to continue with or without the fickle media in attendance. The peaceful protests were launched on 30 March, when thousands of ordinary people in Gaza headed for the nominal border with the Zionist State to demand their right of return as refugees. They have protested and rallied every Friday since then, no matter how many are killed and wounded by Israeli snipers (at least 180 killed and more than 18,000 wounded to date, and counting). The message is loud and clear: they want their homeland back and insist on being allowed to fulfil their legitimate right. If nothing else, I am sure that Ahed Tamimi will take advantage of the media spotlight on herself to highlight the ongoing injustices that she and her people face every single day in the occupied Palestinian territories of the West Bank, Gaza Strip and Jerusalem.